This scarce map was created to promote The World’s Industrial and Cotton Centennial Exposition, in 1884 in New Orleans. The Exposition was organized to commemorate the 100th anniversary of the nation’s cotton industry. In 1882 during its early planning stages, local papers quickly proposed New Orleans as the ideal site for the event, at least in part to advertise the city's commercial revitalization following the end of the Reconstruction era following the US Civil War. The Philadelphia World’s Fair of 1876 had been an unqualified success, far surpassing the expectations of the government and the fair authority, thus providing an incentive to other American cities to follow suit. The New Orleans venue, though hastily organized and constructed, proved equally successful, and during the time it was active from December 1884 through June 1885, it attracted over one million visitors by conservative estimates. Other sources place the figure as high as three million. This map shows a bird’s eye view of the city and its immediate environs. 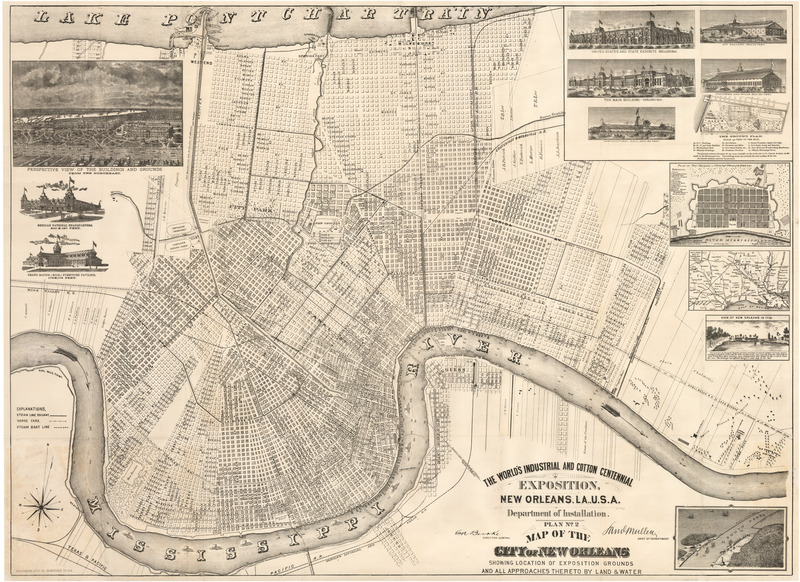 The site of the grounds for the Exhibition, 247 acres in all, is easily located, as the southern boundary is the Mississippi River, with the northern boundary marked by St. Charles Avenue, one of the primary thoroughfares of the city. The venue had its own dock on the river from which entrance was easily, almost immediately accessible. A number of insets surround the city proper, featuring pavilions and other buildings from the Exhibition, a ground plan of the Exhibition, a map of the city dated 1770, a view of the city dated 1719, and a railroad map showing portions of states bordering the Gulf of Mexico. Steam line railways, horse cars and steam boat lines are indicated. Most surviving copies of this map are in institutions. Condition: This map is in A condition. Published as a folding map, it has been backed by rice paper in order to stabilize and prepare it for framing. The original cover is included. 1592 Peruviae Auriferae Regionis Typus, La Florida, Guastecan Reg.